The OrangeRx T-SIX is a brilliant, fully programmable 6 channel 2.4GHz DSM2 compatible transmitter that is loaded with features. Covering just about everything for fixed wing, helicopters and multi-rotors the T-SIX supports multiple wing types, multiple swashplate types, channel mixing, subtrim, exponential, dual rates, travel adjustment, servo monitor, graphic pitch/throttle curves, 10 model memory and so much more! This little gem even features an adjustable RF power output setting in the menu, allowing users to switch between US and EU power standards. 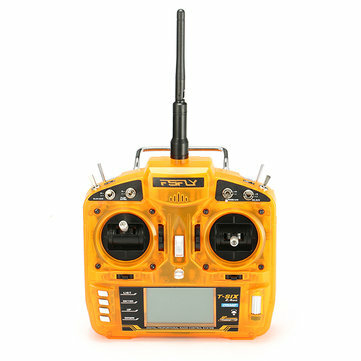 All of the programming functions are displayed on the large and easy to read backlit LCD display. You can easily navigate through the menus with the convenient scroll wheel, or by using the menu buttons. The menu system is very intuitive and easy to use, unlike some other transmitters on the market today that require studying of the manual to operate. When it comes to powering your transmitter, the T-SIX has you covered for just about any battery type. It can operate on 4 x AA size Alkaline, NiMH or NiCD cells, but also features an in-built JST plug in the battery compartment allowing you to use a 2 cell LiFE or LiPO pack as well! The transmitter's low voltage battery alarm is adjustable via the menu to suit whichever battery chemistry you choose. - This is not a Spektrum DSM2 product, nor is it a copy of a Spektrum DSM2 product.The Spektrum and DSM2 brand is a trademark of Horizon Hobbies USA. - This is not an underground black market fake Spektrum product. FsFly quality is guaranteed.